What is Pole Sports ? Welcome to the Swiss Pole Sports Federation. We are the National Governing Body for the sport of Pole, dedicated to developing pole athletes, coaches and clubs across a range of disciplines – Sport, Artistic, Ultra and Para Pole. The Swiss Pole Sports Federation is a not for profit organisation dedicated to positively promoting pole as an athletic sport. Run by voluntary members of the Swiss Pole community and created to foster the development of Pole throughout the nation, the Swiss Pole Sports Federation supports athletes, coaches, judges and enthusiasts to unify the our sport. 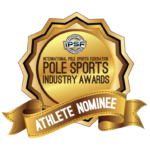 The Swiss Pole Sports Federation is a proud member of the International Pole Sports Federation (IPSF) who governs pole internationally, by setting in place a structured competition, coaching and education format that has been accepted by international sport governing bodies. The IPSF has been awarded Observer member status of the Global Association of International Federations (GAISF), and are Signatories of the World Anti-Doping Association (WADA). The goal of the IPSF and the Swiss Pole Sports Federation is for the Olympic committee to recognise Pole as an official sport, and in turn eventually become part of the Olympic Games. Top athletes are selected from each National Championship to represent Switzerland at the IPSF World Pole Championships annually; more than 40 countries are represented. IPSF judging rules, regulations and scoring have been carefully created by the IPSF technical committee in conjunction with the pole community, to promote a fair and transparent judging. In case you would more information about the activities of the Swiss Pole Sports Federation, please contact us ! Discover the Swiss IPSF Champions 2018 below ! For more performances, have a look at our gallery ! Sandra de Sloovere, Winner Elite Senior Women 18-39 y.o. Romane Moscaritolo, Winner Elite Novice 10-14 y.o. Alan Héritier, Winner Elite Senior Men 18-39 y.o. Copyright © 2019 Swiss Pole Sports Federation (SPSF). All rights reserved.